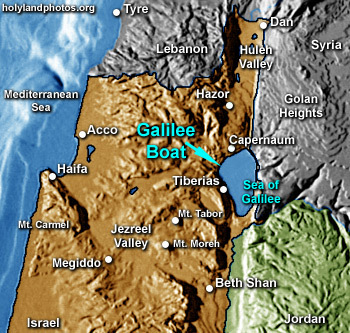 In 1986 an ancient boat was discovered along the northwestern shore of the Sea of Galilee. The boat is a unique find measuring 25.5 ft. [8.2 m.] long with a breadth of 7.5 ft. [2.3 m.]. A boat of this size had a crew of five, and could carry about 15 additional persons. It is dated to the first century A.D. It is evidently the type of boat used on the Sea of Galilee for both fishing and for transportation. Indeed, it may be that this type of boat was used by Jesus and his disciples (boats are mentioned 50 times in the Gospels!). A variety of descriptive comments can be found in association with each image. The boat is tastefully displayed in the Yigal Allon Center on the grounds of Kibbutz Ginosar. To see annotated pictures of the discovery and perservation of the boat Click Here. For excellent products from the Holy Land Click Here.